According to the 2012 U.S. Peace Index report, Nevada is one of the least peaceful states in the country, which makes it imperative to have highly-skilled professionals combating crime. 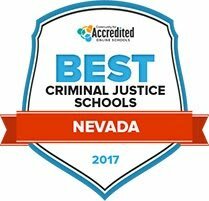 Equally important are the places these professionals are trained: the many different criminal justice schools in Nevada. From large cities like Las Vegas to small rural communities, Nevada presents many opportunities for those who want to work in the criminal justice field—whether they are fighting crime on the street or in the courtroom. This guide explores the educational and career opportunities available to those interested in attending criminal justice school in Nevada. Continue reading to find where the best programs are offered, as well as the common jobs graduates pursue across the state. After Criminal Justice School in Nevada: What's Next? Potential students have many educational options when it comes to criminal justice schools in Nevada. This can make choosing a school challenging. In order to help students make this important decision, this list scores criminal justice schools around the state, based on the cost of tuition, acceptance and enrollment rates and student-teacher ratios, to find the best colleges with criminal justice programs. Some careers that Truckee Meadows Community College's two year criminal justice degree program prepares students to potentially enter are in police departments, corrections and probation and private investigator fields. During the comprehensive academic program, students take courses in subjects like administration of justice, corrections, criminal investigation, and the juvenile justice system with some courses specific to Nevada. Special topics delve into current events and policy changes that impact the criminal justice field. Truckee Meadows Community College has transfer agreements with area four-year colleges and universities that allow graduates of its associate degree program to transfer credits into bachelor's degree programs. The University of Nevada _ Las Vegas offers a bachelor's degree in criminal justice that emphasizes criminal law and its origins, the nature and causes of criminal activity, and ways to reduce crime. Students learn about the history of the criminal justice system, and how it has evolved with the social and political context of the legal system. Beyond crime-specific studies, students will learn about social science research and statistics. Academic advisors are available to guide students in course selection. They can also refer students to campus services that may be of assistance, from the disability resource center to the math tutoring clinic. Criminal justice is a relatively new program at Nevada State College. Students learn about the basics of criminal justice in a framework that takes into consideration social justice and global perspectives. Curriculum also emphasizes the importance of working with the local community, as well as giving back to them. Students with an associate's degree in criminal justice from a regionally accredited community college are encouraged to transfer their credits and enter the program to earn a bachelor's degree. The school offers several tools to promote student success, from academic advising for educational and personal objectives, to tutoring, financial aid, and resources for disabled students. Narrowing down criminal justice schools in Nevada is the first step that prospective students must take in order to build a successful career. Use the tool below to search all the options for criminal justice education in the state, and locate schools based on degree levels offered, type of school, student population and acceptance rates. The occupational landscape for those who graduate from criminal justice schools in Nevada is as diverse as the state itself. Although students who decide to earn these degrees are often following their passion, it’s also important for them to consider the potential salaries and employment numbers their chosen profession will command. The following table provides information on what professionals in the criminal justice field earn in-state, as well as how many Nevadans are employed in those jobs. As with other professions, the earnings and job prospects that criminal justice school grads in Nevada face are largely dependent on their geographical location. The graphs below illustrate how salaries and job growth in Nevada compare to the national averages, and may be a good measure on which criminal justice fields are best to pursue in the state. Every graduate is concerned about where potential jobs are in their chosen profession. For those who earn degrees from criminal justice schools in Nevada, there are a number of options for employment. In the map below outlines some potential employers for criminal justice professionals around the state, as well as the locations in Nevada have the most jobs. A membership organization made up of corporate in-house attorneys across the state of Nevada. The group offers educational programs, networking events and hosts a job listing and pro bono resource page on this site. From business events and forums to advocacy in legislature and politics, the Chamber connects businesses and operates as the economic voice for the community. The state’s Division of Industrial Relations ensures that professionals in Nevada work in safe environments. The agency oversees workers’ compensation, occupational safety, legal and mechanical compliance and safety training. Nevada’s Secretary of State office provides crucial information for those who want to run businesses in Nevada. The site includes information on how to start an LLC, partnership or corporation and offers access to forms and legislation that governs business operations. A group that supports and advocates for Nevada prisoners, family and friends by working to enact reformed criminal justice policies, procedures and programs. Use this page for insight on issues affecting prisoners in the Nevada correctional system. This page of the Department of Corrections outlines the code of conduct expected from those who work in the corrections industry. This is a helpful resource for those interested in pursuing education in corrections. This division of the Department of Public Safety focuses on transferring inmates from correctional facilities back into the community. Details on the department’s different programs and job postings can be found here. Part of the Department of Health and Human Services, the JJS focuses on youth criminal offenders between the ages of 12 and 21. Operating three Youth Training Centers in the state, the JJS designs programs to prevent participants from re-offending. CASA, or Court Appointed Special Advocates, assist in cases involving abused and neglected children. This volunteer-based program provides courtroom and legal procedural training to familiarize Advocates with children’s legal issues. A program taught by law students at the University of Nevada Las Vegas that focuses on teaching children and youth how the court system works. The program has received national recognition for preparing kids who will be part of court cases for real trials. This site provides an overview of the state’s judicial branch, including information on district, municipal, specialty and justice courts. This website contains information about the court system of Nevada, such as programs and services that are offered by the state’s judiciary. In addition, the site has legal forms and a self-help legal center. Since 1966, the Nevada branch of the American Civil Liberties Union has fought for the rights of Nevadans through litigation, lobbying and education services. Local events, volunteer opportunities and current cases and campaign information can be found here. This is a non-profit organization that provides pro bono legal services to low-income Nevada residents. The group offers internships and volunteer opportunities for those interested in legal work. Those interested in becoming a private investigator can review the information on this site. Details on licensing, exams and legal practices can be found here. Founded in 1978, this professional organization connects, advances and advocates for women in the legal industry in Northern Nevada. Information on legal news, networking and special events and the group’s blog can be found here. The Paralegal Division of the State Bar of Nevada organizes professional events and continuing education courses to help these legal support professionals best serve the attorneys and businesses they work for. In concert with the Nevada Supreme Court, the bar association creates work standards for attorneys and offers education and professional development programs. This government agency oversees the state’s highway patrol, capitol police, emergency management and parole and probation services. Get details on each facet of protective service here. A membership organization for law enforcement officers across Nevada, the group provides events, blogs and news for those who work as public safety officers in Nevada. Those interested in learning more about the Nevada Highway Patrol, including their training programs, traffic laws and the agency’s enforcement protocols can visit this page. The NSLEOA represents the needs of 23 law enforcement agencies around the state, including driving legal and legislative initiatives. This group is dedicated to creating a fellowship among police sheriffs and chiefs around Nevada. The organization provides training programs and networking events for members. This state agency manages fish and wildlife resources in Nevada, and the duties and initiatives of game wardens in the state are outlined on this page. The government agency charged with protecting Nevada’s forests and land, including law enforcement and land stewardship and ethics. Details on the state fire program as well as job information is included. From mining regulations to waste management and air quality control, the Nevada DEP is the governing body of legal restrictions and regulatory practices concerning the environment in the state. Employment information can also be found here. This page details how the Nevada branch of the National Guard helps protect and enforce environmental laws and regulations across the state. Those interested in service can explore the Guard’s other initiatives in the community and public affairs sectors as well. A public policy group advocating for political and legislative reforms in regards to environmental practices across the western United States. Initiatives are detailed on this site, which also directs users on ways to help each cause.